It has been estimated that an average mammalian cell produces more than 10.000 proteins at a given stage. 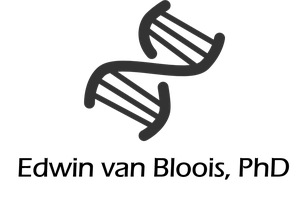 These are typically synthesized on ribosomes as linear chains of amino acids and rely on the assistance of dedicated helpers to properly fold into their biologically active conformation. These helpers are known as molecular chaperones and comprise specialized proteins that guide newly synthesized proteins along their productive folding pathway, thereby preventing unproductive interactions (1). Molecular chaperones are ubiquitously present in all cells and many are essential proteins under cellular stress conditions. In fact, chaperones were originally identified as upregulated proteins that contributed to cell survival after heat shock (1). Consequently, chaperones are classified as heat shock proteins (HSP) and their molecular weight. Each cell contains different structurally unrelated chaperones that act together in overlapping networks. A variety of distinct Hsp families is currently known and these include the Hsp40, Hsp60, Hsp70, Hsp90 and Hsp100 system. Molecular chaperones generally avert protein misfolding through binding to the newly synthesized polypeptide and promote its folding either passively or actively. For example, members of the Hsp70 and Hsp90 families bind to exposed hydrophobic peptide segments in unfolded or partially folded substrate proteins and facilitate their folding at the expense of ATP. These chaperones are therefore known as foldases. Hydrolysis of ATP typically drives conformational changes within the chaperone, thereby switching it from an inactive open state to an active closed state (1). Whereas a subset of small Hsps facilitate ATP-independent protein folding. This is achieved by continued binding of the chaperone to the substrate protein until folding is completed. These chaperones are known as holdases and their binding probably creates a secluded environment that allows the folding of local domains within the substrate protein (1). Molecular chaperones are, therefore, a crucial part of the cell’s quality control mechanism that prevents protein misfolding. However, under unusual conditions this quality control system fails, allowing the misfolding of certain proteins and this, in turn, results in their toxic aggregation. It is therefore not surprising that protein misfolding and the inappropriate aggregation of proteins is associated with different devastating human diseases, such as cystic fibrosis, cancer, ALS, Alzheimer’s and Huntington’s disease (2). 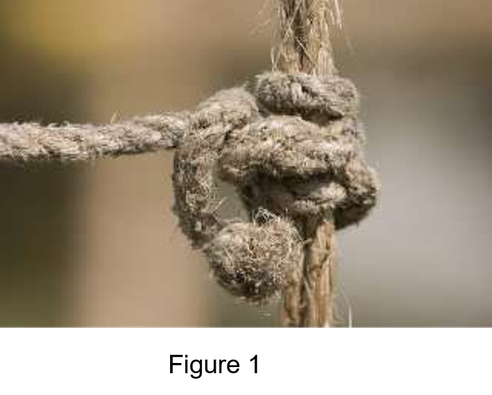 In this respect it is interesting to note that cells possess molecular machines that are able to disentangle these proteinaceous knots (figure 1). Specifically, Hsp104 and ClpB (caseinolytic peptidase B) are homologous chaperones found in eukaryotes and bacteria, respectively. These are able to refold toxic protein aggregates into the native state in cooperation with specific Hsp70 chaperones. Hsp104 and ClpB are members of the AAA+ superfamily of ATPases and both are active as a hexamer with a central pore. These ring-shaped hexamers extract polypeptides from aggregates and thread it through the central pore to unfold it. Subsequently, the polypeptide is released in to the cell for chaperone-mediated refolding (3). Here, I will discuss the structural and biochemical properties as well as mechanistic aspects of ClpB/Hsp104. Bacterial ClpB and yeast Hsp104 are homologous molecular chaperones that belong to the AAA+ superfamily of ATPases (3). Members of this family are found throughout all biological kingdoms and share a characteristic module of about 250 residues, which comprises a conserved ATPase domain (4). AAA proteins utilize the chemical energy released upon ATP hydrolysis to drive conformational changes which is transduced into a mechanical force that powers the translocation and remodeling of substrate proteins (4). Additional Hsp104 homologs have been found in mitochondria, fungi, archaea and plants. Yeast Hsp104 was first identified as a stress protein that confers thermotolerance (5), while it was shown later to behave as a molecular chaperone with protein disaggregation activity (6). E. coli ClpB was initially thought to be part of a proteolytic system based on its ATPase activity and sequence homology to ClpA (7). However, it was subsequently established that it is part of the E. coli chaperone system and partners in vivo with DnaK (Hsp70) in the resolubilization of protein aggregates (8). Likewise, Hsp104 cooperates in yeast cells with Hsp70 in the dissolution of protein aggregates (6). Using an in vitro refolding assay with denatured luciferase and purified Hsp104 and Hsp70 or ClpB and DnaK it was established that the activity of both chaperone systems is required for the efficient refolding of luciferase, whereas the presence of either one alone is not sufficient to restore luciferase activity (9,10). Several lines of evidence point towards a physical association between ClpB and DnaK. Firstly, complex formation between purified ClpB and DnaK from Thermus thermophiles was reported (11). This complex was not observed in the presence of ADP or when E. coli DnaK was used together with T. thermophiles ClpB. Moreover, a direct interaction between DnaK and ClpB was observed in NMR experiments as well as in site-specific crosslinking studies (12,13). Although the exact molecular mechanism of this bi-chaperone system is not fully understood, it is conceivable that ClpB/Hsp104 ring-shaped hexamers extract polypeptides from aggregates and thread it through the central pore to unfold it. Subsequently, the polypeptide is released and refolded by DnaK/Hsp70. However, evidence has been presented implicating DnaK/Hsp70 in presenting substrate proteins to ClpB/Hsp104 (3). Yeast Hsp104 and E. coli ClpB are proteins with a mass of about 100 kDa. Similar to many other AAA proteins, Hsp104/ClpB assemble into hexameric ring-shaped structures that represent its biologically active conformation. Several structures of truncated E. coli ClpB or its domains have been solved, whereas the structure of ClpB from Thermus thermophilus is the only crystal structure of the full-length protein (14). This was solved at 3.0 Å and is shown in figure 2, revealing that ClpB is made up of four domains, namely: an N-terminal domain (in green), the first AAA module (in red), an middle (M) domain (in yellow) and a second AAA module (in blue) at the C-terminus. The role of the N-domain is not fully understood, although it has been implicated in substrate binding (15,16). ClpB contains two prototypical AAA modules made up of α-helical and β-sheet regions that bind and hydrolyze ATP. Binding of ATP stabilizes its oligomeric structure as well as interactions with substrate proteins. Hydrolysis of ATP provides the energy for conformational changes that are ultimately transduced into a mechanical force that powers the translocation and unfolding of substrate proteins. Moreover, both AAA modules are involved in the binding of substrate proteins through flexible loops that extend into the central pore of the hexameric structure and contain conserved tyrosine residues. The M-domain is sandwiched between both AAA modules and consist of two anti-parallel coiled-coils, resembling a two-bladed propeller. This domain is unique to ClpB/Hsp104 homologs and is required for DnaK binding (12,13). Moreover, the M-domain is crucial for the functionality of ClpB because it represses the disaggregase activity, which is turned on by binding of DnaK (13). Hence, the M-domain acts to switch ClpB on through coupling DnaK binding to ATP hydrolysis and ultimately remodeling of substrate proteins. Yeast Hsp104 is able to resolve toxic protein aggregates that are associated with neurodegenerative diseases, while, on the other hand, it also remodels fibers of a yeast prion, thereby supporting its propagation. Although it is generally assumed that, similar to other AAA proteins, Hsp104/ClpB assemble into the biologically active ring-shaped hexameric structure direct structural evidence for this conformation is scant. This is probably due to the highly dynamic nature of this complex which makes its crystallization a challenging task. Therefore, other methods have been employed to establish the structure of the wildtype Hsp104/ ClpB complex. In this respect it is interesting to note that recently a cryo-EM reconstruction of the wildtype Hsp104 hexameric assembly at 5.6 Å was presented (17). 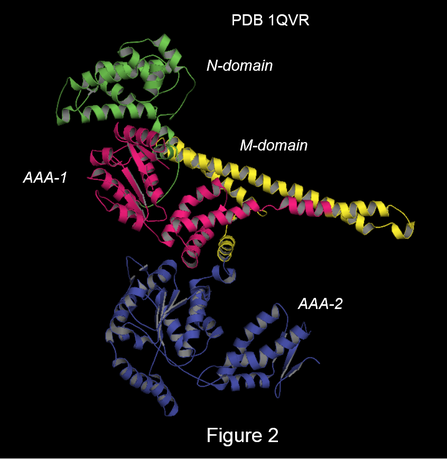 This structure is shown in figure 3 and reveals a similar domain organization for monomeric Hsp104 as for ClpB (left panel) with the N-terminal domain in green, the first AAA module in blue, the M-domain in yellow and the second AAA module at the C-terminus in orange. Interestingly, the structure of Hsp104 was solved in the ATP-bound state (using a non-hydrolyzable ATP analog), and this analog is shown as blue spheres in both AAA modules. In addition to the aforementioned domains shared between Hsp104 and ClpB, Hsp104 contains a small C-terminal domain that is proposed to function in chaperone binding (17). A ribbon model of the 3D reconstruction is shown in the middle and right panel and reveals a ring-shaped hexamer with the three layers clearly visible (middle panel), corresponding to the N-terminal domain, AAA-1 and AAA-2. The subunits are arranged in a helical spiral with a central pore (indicated with an asterisk in the right panel), which has a diameter of about 25Å and opens into a cleft at the rim of the pore (right bottom of the structure). This cleft is formed by several N-domains (middle panel) that surround the central pore and form a C-shaped entrance. These domains are essential for the initial binding of substrate proteins and they may also interact with protein aggregates. Conceivably, these N-domains function as platform for binding of substrate proteins and chaperones and their arrangement in combination with the central pore creates a path for the binding of substrate proteins and translocation into the channel. The AAA modules are folded into a globular conformation that interact with each other and make up a broad entrance of the central pore. The exit of the channel is formed by AAA-2. Each AAA module contains flexible loops that comprise several conserved tyrosine residues, that bind substrate proteins and are required for disaggregation. These loops are proposed to project towards the channel and are therefore ideally positioned to transfer substrates in a stepwise fashion between the AAA modules of different subunits (16). This cooperative use of both AAA modules results in a more powerful unfolding. The coiled coil M-domain is located on the outside of the complex and is wrapped around the neighboring subunit’s AAA module, thereby acting as a switch that controls ATP hydrolysis as explained above. Thus, the hexameric Hsp104 assembly comprises a molecular machine that harnesses the mechanical power of 12 ATPase domains for dissolution of protein aggregates. It is assumed that, similar to other AAA+ family members, substrate proteins are translocated through the central pore of ClpB/Hsp104 and are subsequently remodeled. No crystal structures of a ClpB/Hsp104 hexameric ring with a protein substrate are available to support this notion. However, a cryo-EM reconstruction of the wildtype Hsp104 hexameric assembly with casein as model substrate and a non hydrolyzable ATP analogue was presented at 4 Å recently (18). This model is shown in figure 4 and clearly shows a three-layered structure, corresponding to the N-terminal domain, the first AAA module and the second AAA module (left panel). Importantly, this complex was only formed in the presence of a non-hydrolyzable ATP analog. Under these conditions, two different hexameric assemblies were observed, namely: closed and extended. The latter structure is shown in figure 4 and clearly shows unfolded casein in the channel pore (in grey), which interacts with pore loops from both AAA modules. In the closed state, the substrate protein contacts the pore loops of five subunits, while in the extended state the substrate interacts will all six subunits. The substrate interactions are mediated mainly by conserved tyrosines in the pore loops. Based on these structures, it was suggested that the closed to extended conformational change of the hexameric assembly drives the translocation of an unfolded substrate in a stepwise fashion of two residues per step through a rotary mechanism. Conceivably, this translocation mechanism is conserved amongst AAA+ proteins. Several lines of evidence indicate that in general AAA+ proteins are highly dynamic that are unlikely to exist in a single structural conformation. Indeed, structural studies on AAA+ proteins in their hexameric state reveal a variety of conformations, ranging from open to closed forms. The closed conformation probably represents the state that favors ATP binding (19). Similar to other AAA+ proteins, structural studies on ClpB/Hsp104 have identified conformational changes as well as variations in pore diameter, suggesting that the oligomeric assembly is heterogeneous and versatile during the disaggregation process. The ATP-dependent structural states of ClpB were recently assessed by high-speed atomic force microscopy (HS-AFM) (20). This revealed major conformational changes in the hexameric ring during ATP hydrolysis, resulting in highly diverse and transient oligomeric forms. In the presence of ATP, different conformations were observed with the closed and open state being the most prominent (figure 3 right panel adopted from 19). The number of closed rings increased with a higher ATP concentration, suggesting that binding of ATP induces formation of closed rings, while, in the presence of ADP, the ring became distorted. Further, analysis of functionally increased or impaired mutants revealed that the open ring conformation probably display aggregation activity. To dissect the roles of the AAA modules, mutants defective in AAA-1 or AAA-2 were investigated. This showed that ATP binding to AAA-1 is essential for assembly of ClpB, whereas binding of ATP to AAA-2 controls the number of protomers that are incorporated into the oligomer, and is thereby critical for formation of the hexameric ring. ATP hydrolysis in AAA-2 induces large conformational changes. Accumulating evidence associates inappropriate aggregation of proteins with a growing number of human pathologies, including cystic fibrosis, cancer, ALS, Alzheimer’s and Huntington’s disease (2). Under normal conditions, protein folding is monitored in the cell by a tightly orchestrated quality control system made up of overlapping chaperone and protease networks. These ensure the folding of newly synthesized proteins into their biologically active conformation and removal of malfolded or otherwise dysfunctional proteins (1). In addition, molecular chaperones that are able to refold aggregated proteins have been identified in almost all organisms. Yeast Hsp104 and its bacterial homologue ClpB represent the best characterized examples of these. Both proteins belong to the AAA+ superfamily of ATPases and are active as a hexameric oligomer with a central pore (3). It is assumed that substrate proteins are translocated through the central pore and subsequently unfolded. These events are driven by massive conformational changes in the hexameric complex, which are powered by ATP hydrolysis. For full disaggregase activity Hsp104 and ClpB work together with Hsp70 chaperones (DnaK). These associate with the hexameric assembly and probably assist in the extraction of proteins from aggregates as well as presentation of substrate proteins prior to translocation. Conceivably, Hsp70/DnaK also facilitate the refolding of substrate proteins that are released from the Hsp104/ClpB complex. Recent studies have provided cryo-EM reconstructions of the wildtype Hsp104 hexameric assembly with or without an unfolded substrate protein (17,18). These studies significantly furthered the mechanistic understanding of Hsp104, revealing that specific conformational changes of the hexameric assembly drive the translocation of an unfolded substrate in a stepwise fashion of two residues per step through a rotary mechanism. Hsp104’s mode of action is illustrated in the following movie (18). 1. Hartl FU, Bracher A, Hayer-Hartl M. 2011. Molecular chaperones in protein folding and proteostasis. Nature. 475: 324-332. 2. Aguzzi A, O'Connor T. 2010. Protein aggregation diseases: pathogenicity and therapeutic perspectives. Nat Rev Drug Discov. 9: 237-248. 3. Doyle SM, Wickner S. 2009. Hsp104 and ClpB: protein disaggregating machines. Trends Biochem Sci. 34: 40-48. 4. Erzberger JP, Berger JM. 2006. Evolutionary relationships and structural mechanisms of AAA+ proteins. Annu Rev Biophys Biomol Struct. 35: 93-114. 5. Sanchez Y, Lindquist SL. 1990. HSP104 required for induced thermotolerance. Science. 248: 1112-1115. 6. Parsell DA, Kowal AS, Singer MA, Lindquist S. 1994. Protein disaggregation mediated by heat-shock protein Hsp104. Nature. 372: 475-478. 7. Woo KM, Kim KI, Goldberg AL, Ha DB, Chung CH. 1992. The heat-shock protein ClpB in Escherichia coli is a protein-activated ATPase. J Biol Chem. 267: 20429-20434. 8. g Mogk A, Tomoyasu T, Goloubinoff P, Rüdiger S, Röder D, Langen H, Bukau B. 1999. Identification of thermolabile Escherichia coli proteins: prevention and reversion of aggregation by DnaK and ClpB. EMBO J. 18: 6934-6349. 9. Glover JR, Lindquist S. 1998. Hsp104, Hsp70, and Hsp40: a novel chaperone system that rescues previously aggregated proteins. Cell. 94: 73-82. 10. Zolkiewski M. 1999. ClpB cooperates with DnaK, DnaJ, and GrpE in suppressing protein aggregation. A novel multi-chaperone system from Escherichia coli. J Biol Chem. 274: 28083-28086. 11. Schlee S, Beinker P, Akhrymuk A, Reinstein J. 2004. A chaperone network for the resolubilization of protein aggregates: direct interaction of ClpB and DnaK. J Mol Biol. 336: 275-285. 12. Rosenzweig R, Moradi S, Zarrine-Afsar A, Glover JR, Kay LE. 2013. Unraveling the mechanism of protein disaggregation through a ClpB-DnaK interaction. Science. 2013 Mar 1;339(6123):1080-1083. 13. Seyffer F, Kummer E, Oguchi Y, Winkler J, Kumar M, Zahn R, Sourjik V, Bukau B, Mogk A. 2012. Hsp70 proteins bind Hsp100 regulatory M domains to activate AAA+ disaggregase at aggregate surfaces. Nat Struct Mol Biol. 19: 1347-1355. 14. Lee S, Sowa ME, Watanabe YH, Sigler PB, Chiu W, Yoshida M, Tsai FT. 2003. The structure of ClpB: a molecular chaperone that rescues proteins from an aggregated state. Cell. 115: 229-240. 15. Doyle SM, Hoskins JR, Wickner S.2012. DnaK chaperone-dependent disaggregation by caseinolytic peptidase B (ClpB) mutants reveals functional overlap in the N-terminal domain and nucleotide-binding domain-1 pore tyrosine. J Biol Chem. 287: 28470-28479. 16. Rosenzweig R, Farber P, Velyvis A, Rennella E, Latham MP, Kay LE. 2015. ClpB N-terminal domain plays a regulatory role in protein disaggregation. Proc Natl Acad Sci U S A. 112(50):E6872-81. 17. Yokom AL, Gates SN, Jackrel ME, Mack KL, Su M, Shorter J, Southworth DR. 2016. Spiral architecture of the Hsp104 disaggregase reveals the basis for polypeptide translocation. Nat Struct Mol Biol. 9: 830-837. 18. Gates SN, Yokom AL, Lin J, Jackrel ME, Rizo AN, Kendsersky NM, Buell CE, Sweeny EA, Mack KL, Chuang E, Torrente MP, Su M, Shorter J, Southworth DR. 2017. Ratchet-like polypeptide translocation mechanism of the AAA+ disaggregase Hsp104. Science. 357: 273-279. 19. Zhu Y, Wang WL, Yu D, Ouyang Q, Lu Y, Mao Y. 2018. Structural mechanism for nucleotide-driven remodeling of the AAA-ATPase unfoldase in the activated human 26S proteasome. Nat Commun. 9: 1360. 20. Uchihashi T, Watanabe YH, Nakazaki Y, Yamasaki T, Watanabe H, Maruno T, Ishii K, Uchiyama S, Song C, Murata K, Iino R, Ando T. 72018. Dynamic structural states of ClpB involved in its disaggregation function. Nat Commun. 9: 2147.